← Petersen Automotive Museum – Not just cars, you might party, too! Summer is here, yahoo!!! So I thought I would share ideas on what to do this summer. I’m going to start with hikes, because as you probably know already, it’s my family’s favorite activity to do during the summer. 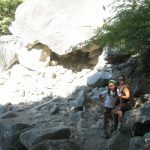 I’m going to share with you our top favorite hike, which is in Yosemite National Park. 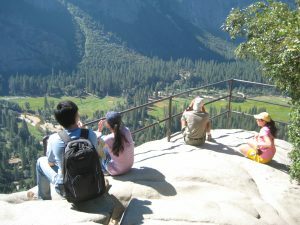 Thousands of travelers visit Yosemite National Park for their summer vacation. 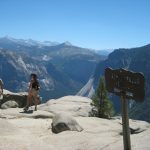 While there are many things to do in Yosemite, do not miss one of the best hikes in the world and that’s up North America’s tallest waterfall, on The Yosemite Falls Trail. 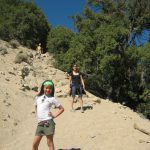 There are a few hiking options here for you, depending on how much time you want to spend on the trail, how good of shape you’re in, or if you just want an easy hike. 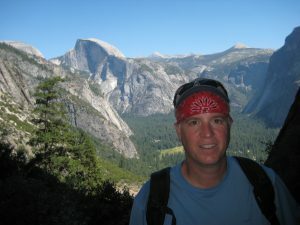 I recommend going all the way up to the top of Upper Yosemite Falls for the best views of the Yosemite Valley. 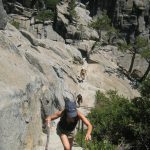 Either way, Yosemite Falls Trail offers an epic day hike! 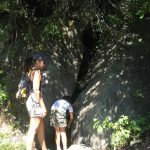 This hike is considered to be a very popular, easy hike. This trail is very busy, but it’s worth it. 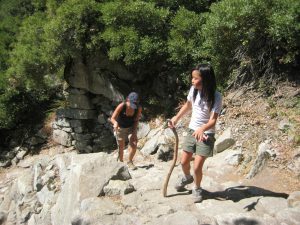 This one mile loop hike takes about 30 minutes, with an elevation gain of 50 feet. 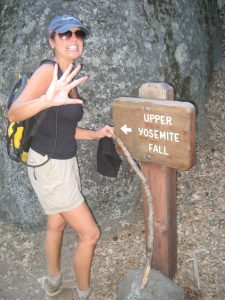 You’ll start at the Lower Yosemite Fall Trail head at shuttle bus stop #6. The loop Trail is paved and is open year round. 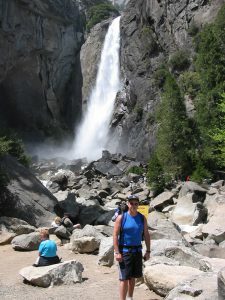 From spring to early summer, expect to get wet and expect a crowded trail. 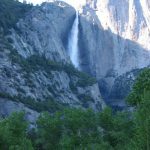 Glorious views of both Lower Yosemite Falls and Upper Yosemite Falls, you will find!! 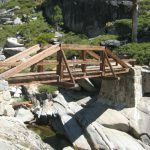 This historic trail was built from 1873 to 1877 and it’s one of the oldest trails in the park. 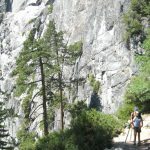 This trail will take you to the top of North America’s tallest waterfall, which is 2,425 feet above Yosemite’s valley floor. 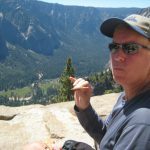 It’s a strenuous hike and will take 6-8 hours of 7.2 miles round trip. 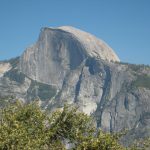 If going to the top seems too long and too hard, you can just go to Columbia Rock, which is considered to be a moderate hike. It’s only 2 miles round trip, which will take you 2-3 hours to complete. 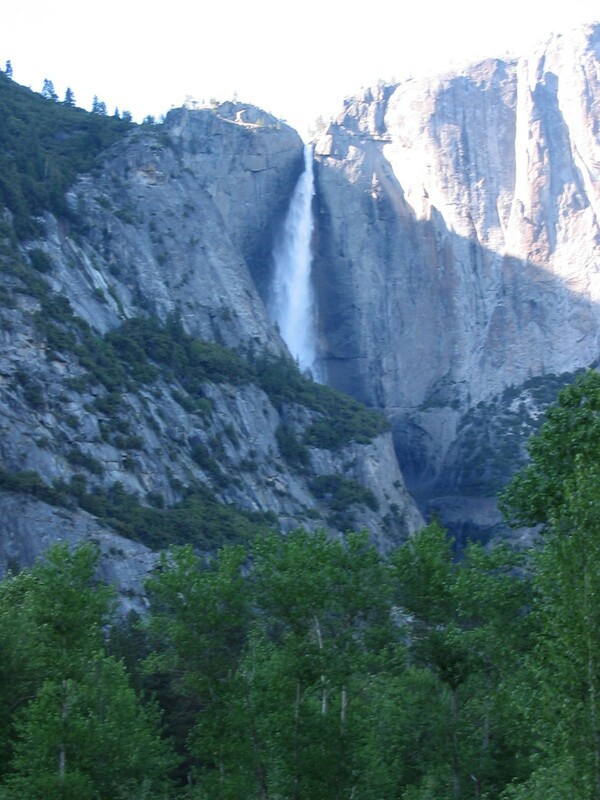 You will find gorgeous views of the Yosemite Valley. 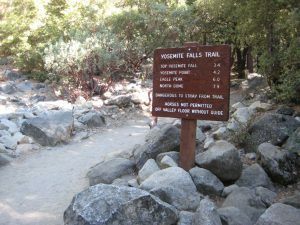 Upper Yosemite Falls Trail will start at Camp 4 at the Valley Loop Trail, near Shuttle bus stop #7, also near El Capitan Shuttle stop #E2. 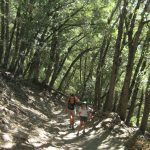 The hike starts at an immediate climb, with switchbacks galore, going through a shaded oak forest. Thereafter, you will start hiking above the trees. Wear sunscreen, you will be in the sun at this point. Soon, you’ll see famous views! After a mile, youll arrive at Columbia Rock. 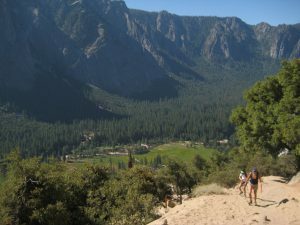 It sounds pretty easy, but it’s a tough hike with dozens of switchbacks! 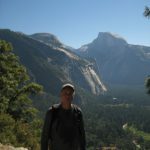 You will find magnificent views of the Yosemite Valley and if you go just a half mile further, you’ll see Half Dome and Sentinel Rock. There’ll be many people hanging out at Columbia Rock. If you’ve had enough, you should turn around here. But if you continue on, the crowd thins out and the experience gets even better, although it’ll get way harder. 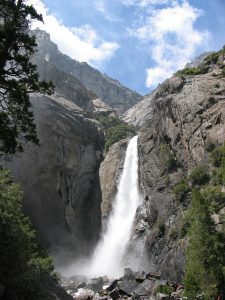 At this point, you’ll begin the upper half of the Yosemite Falls Trail. It becomes very steep and rocky. You’ll come across Yosemite Creek, which feeds into the massive waterfall. It’s only a small creek here. 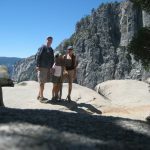 It’s another 1.6 mile to the top of Yosemite Falls and the views are outstanding. 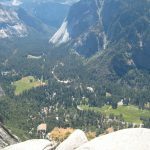 If you are strong enough, you can continue to Yosemite Point, which is an extra 1.6 mile round trip or to Eagle Peak which is 5.8 mile round trip. 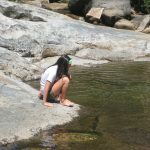 We chose to have lunch at the top and linger around the creek to rest. It’s the most wonderful spot to relax at! Make sure you get enough rest before heading back down. The hike down is easier, but still tough, because you’ll be tired and accidents can happen when you’re tired. Plus, walking down on loose rocks can be tricky. When you walk back down into the oak forest, that paved trail will feel great. However, the hike will soon be over. You’ll feel relieved, but sad. Be sure to start early in the morning, so you don’t hike in the heat of the day and you don’t end your hike in the dark. 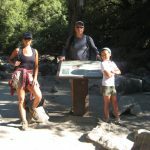 Check weather conditions before you start your hike. Always wear sunscreen and bring plenty of water. 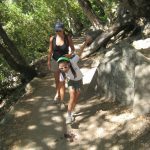 The most common injury on this trail are sprained ankles, so wear good hiking boots with good support. If it’s spring or early summer, you will get wet, dress accordingly. Stay on the trail and know your limits!! Don’t feed the animals and don’t swim in the creek, above the waterfall. Most important, enjoy the most beautiful hike in the world!! Thanks for visiting my blog!! Yes, very blissful!